The largest and most spectacular landmark in the Woodside area of Newark is Mt. Pleasant Cemetery, bounded on the east by the Passaic River, on the west by Broadway, on the north by Herbert Place, and on the south by Luis Munoz Mann Middle School. Not just any ordinary cemetery, Mt. Pleasant is one of the nation's earliest and best examples of a 'rural cemetery, ' similar in design and feeling to Brooklyn's Green-Wood, Boston's Mt. Auburn and Philadelphia's Laurel Hill cemeteries. With the emergence of these new burial grounds, the whole pre-Victorian concept of crowded church yards was replaced by the beauty of well-landscaped and handsomely designed parks where relatives could visit graves of their loved ones and remember good times surrounded by man-made and natural beauty. The 'rural cemetery' was a cultural phenomenon of the 19th century in this country that 'came about as a result of increasing urbanization and the changing ideas concerning the relation of cityscape and countryside in an urbanizing society.' The term 'rural cemetery' thus came to denote a burial ground on the outskirts of a city, designed according to the romantic conventions of a picturesque style of landscape gardening. In Newark, Mt. Pleasant not only was intended for the dead, it was designed as well for the living—for picnics, carriage rides, summer outings, and an occasional viewing of the Passaic River regattas. In 1843, a group of men met to 'discuss the expediency of establishing a rural cemetery in the immediate vicinity of Newark.' Horace Baldwin, a jewelry manufacturer, sought to create a place that would be 'beautiful, attractive and consoling—not gloomy and repulsive—surrounded with everything of reflective emotions.' His associates in this endeavor were William Rankin, Isaac Baldwin, and Algernon S. Hubbell. Eventually, the small plot they began to develop was extended to 36 acres of what is now the most beautiful landscaped area in Newark. Although Mt. Pleasant was not Newark's oldest cemetery, it has acquired that title with the loss of the burial grounds behind Old First Church in the early 1960s. There were several requirements to qualify as a rural cemetery: beautiful landscaping, winding paths and carriage ways, and a profusion of finely sculpted monuments. Mt. Pleasant has been inordinately successful in all three areas. Deciduous and evergreen trees of great beauty are common in the cemetery/park environment as are horse chestnuts, dogwoods, sycamores, lindens, and maples. The variety and handsomeness is so overpowering it in many ways might be called Newark's unofficial arboretum. The paths and carriage ways are named for native ash, elm, locust, oak, poplar, walnut and willows which are found everywhere in great abundance as well as for the ivy, honeysuckle, jasmine, lavender, greenbrier, almond, woodbine and primrose that visually caress and enhance the location. 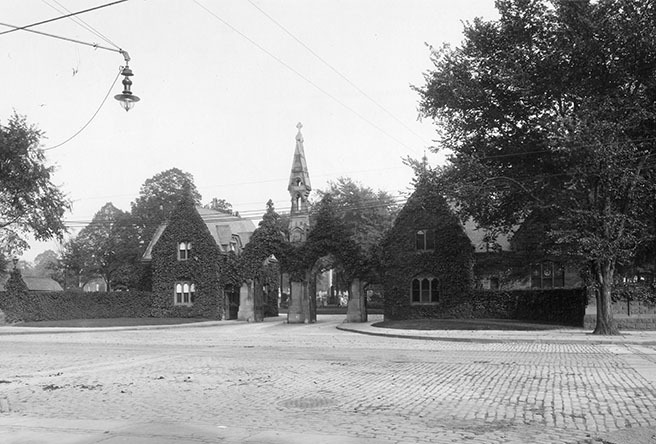 The cemetery's first structure was a classically styled gatehouse and office constructed at the Broadway entrance. It was replaced in 1877 by the present Belleville Quarry brownstone designed by Thomas Stent in the Victorian Gothic style. Included in the entrance way are double elegantly decorated wrought-iron gates. In 1885 a projecting bell-cote with exposed wooden supports, was added to the building's rear gable by architect James Lindaley, who designed the Harvey Street gates to match their Broadway counterparts. A massive Gothic receiving vault of rock-faced Belleville brown stone was completed, a carriage house constructed, and the Founder's Monument erected in tribute to Baldwin, Rankin and Hubbell. Burial in the cemetery was in family plots surrounded by ivy or low stone walls. By 1900 dividers were discouraged because of maintenance problems. The dividing of 'territorial' areas was generally discouraged. Over the years the style of monuments included Gothic, Romanesque, Egyptian, Baroque, Neoclassical, Victorian and Art Deco styles. Individual markers pointed out the final resting places of some of Newark's most prominent personalities. In some instances, a simple headstone or pier monument was sufficient. In other cases, great columns stood on top of elaborate pedestals pointing to heaven. Crosses of all types, from simple to elaborate Celtic design, were created at Tiffany's, and the rich often selected a sarcophagus, an elaborate stone monument large enough to hold a casket above ground. The very rich also had mausoleums designed for their family decorated with bronze doors and stained glass windows in a lavish variety of styles. The cemetery's mausoleum row included the tomb of Parthenia Burky Garratt, which to this day contains a 7-watt light reflecting through translucent urns. During her lifetime, Mrs. Garratt would visit the site to make certain that it was kept clean. If she disapproved, her chauffeur left a pair of soiled gloves at the superintendent's office. Among the individual monuments are several that deserve special mention. These include the 1892 statue of Maud Munn, an 11-year-old dance student who died on New Year's Day, and the memorial to Andrew C. Hand, who died in a fall from a fruit tree. His epitaph reads: 'That cherry tree of luscious fruit. Beguiled him too high, a branch did break. And down he fell and broke his neck and died July 13, 1862.' On the grand scale is the great mausoleum of John Dryden, first president of the Prudential Insurance Co., whose monument is the largest in the cemetery. One wise guy called it as large as the Vermont statehouse. A more deferential observer described it as 'one of the largest and most expensive in the country, characterized by strong, pure architectural lines.' Another unique memorial is the Firemen's group. In it are contained all the traditional symbols of the profession as well as a tall pedestal topped by a handsome fireman. The stone gates are formed of upright hose nozzles bracketed by hooks and ladders. A pipe fence around the plot is supported by stanchions resembling old-time fire hydrants. Originally designed as a final resting place for Newark's unmarried firemen, it is clearly a special corner of the cemetery. Reading like a blue book or social register of past Newark, the cemetery's rolls include patent leather inventor Seth Boyden; Frederick T. Frelinghuysen, a U.S. senator and secretary of state; the Farrand family of Newark Academy fame and college presidencies; Newark mayors Julius Lebkuecher and Thomas Peddie; the Scudders of The Newark News, the McCarters, Clarks and Ballantines of big business; Mary Stillwell, wife of Thomas Edison; Samuel Augustus Ward, who wrote the melody of America the Beautiful; the Flippels of foundation fame, governors Franklin Murphy and Marcus Ward, and on and on. Alexander J. Willman, secretary and superintendent of Mt. Pleasant Cemetery for the past 37 years, noted that he was still in awe of the names chiseled on the stately monuments and often imagined what the funerals with horses and carriages were like as corteges would make their way through the beautiful tree-lined roads to the tolling of the chapel bell. Today, the carriages are gone, but the beauty and reverence remain in a resting place for some of Newark's most interesting people. While this section of Woodside, Forest Hill, or North Newark, contains dozens of other interesting and important landmarks, which we will eventually visit, there are two others that need mentioning only briefly while we are in this part of town – an early home of Mutual Benefit and the present headquarters of the New Jersey Historical Society. Now known as MBL Life Assurance Co., Mutual Benefit is one of the city's oldest commercial institutions, founded in 1845. During its long existence it has occupied four different headquarters in town. In 1927, its leaders commissioned Newark architects John H. and Wilson C. Ely to design the renaissance business palace at 300 Broadway, which it occupied for 27 years before moving to its present headquarters on Broad Street at Washington Park. The six story classical-columned Broadway building, sheathed with ashlar-patterned limestone, contains double-hung bronze windows with spandrel panels between the third and fifth floors, a 1,000-seat auditorium, and 12 elevators. In 1954 it became home of Essex Catholic High School. Today it serves as the Hospitality Care Center. Just down the street is The New Jersey Historical Society. Built in the classical tradition in 1929 for $350,000 at Broadway and Taylor, the society is dedicated to those 'to discover, procure and preserve whatever relates to any part of the history of New Jersey. While the society has been part of Newark since 1845, making it the state's oldest cultural agency, it has been located in this section for more than 60 years. This spring the society will move to a new downtown headquarters in the old Essex Club. The next time you go flying along McCarter Highway and see the tail-end of Mt. Pleasant Cemetery, remember some of the history that has gone on here—the authors, ghosts, regattas, Revolutionary War maneuvers, the making of calico, the fine homes and mansions, the duels, the drinking parties, and the final resting place of important people. All these things combine to create an important part of local and American history.